Below you will find articles relating to general health news and updates as well as the latest Heart of Texas Healthcare System news. We will also regularly post hospital updates, events, health notices, and general news on this page. Heart of Texas Healthcare System offers low-cost mammograms to women through Oct. 31. Breast cancer continues to be the second-leading cause of death among Texan women each year. Digital mammograms and other screening techniques can make the difference between life and death. At the Heart of Texas Healthcare System, the availability of local screenings for women, including digital mammograms and bone density scans, is not only a convenient choice for residents, but it also helps with early detection and mortality rates among women in McCulloch County and the surrounding areas. Breast cancer is a group of diseases that affects breast tissue. Both women and men can get breast cancer, though it is much more common in women. Other than skin cancer, breast cancer is the most common cancer among women in the United States. Some women are at higher risk for breast cancer than others because of their personal or family medical history or because of certain changes in their genes. It is estimated that approximately 12,289 Texas women are diagnosed with invasive breast cancer each year, with approximately 2,524 Texans dying from the cancer each year. The hospital is proud to feature a permanent digital mammography scanner. The scanner remains the most practical and accurate screening tool available for the early detection of breast cancer. Having a digital mammography scanner as a fixture locally brings much value to the community, as many rural regions rely on mobile units that are brought in a few times a year. The digital mammography scanner at Heart of Texas Healthcare System is similar to equipment used in larger hospitals and provides many advantages over older film-based scanners. Digital mammograms are like older scanners, except that images are processed using advanced computer imaging technology. They produce higher-resolution images that can reveal detailed x-ray images of the breast. In addition, Denson, says, mammograms are generally not as painful today, thanks to advancements in technology. She adds that while sensitivity varies from patient to patient, the measure is insignificant compared to the burden that cancer can put on one’s body. According to the latest data from the American Cancer Society, nearly 33 percent of women in the recommended age group have not had a mammogram. At Heart of Texas Healthcare System a doctor’s order is required to receive a mammogram. If you do not have a physician to order your mammogram please call us at 325-792-3535 and we will help you find a provider. Medicare, Medicaid, and most private health plans cover all or part of the cost of these screenings. If you have no insurance coverage for your mammogram, the Laura Bush Institute of San Angelo Texas will work with you to have your mammogram at no charge. You may reach the Instituate at 325-486-6478. Through October, the Heart of Texas Healthcare System will be offering low-cost mammograms for individuals for only $100 plus the cost of interpretation by a radiologist. This fee is a dramatic cost reduction, given the full cost of a mammogram screening, which can cost upwards of $300. In addition to digital mammograms, Heart of Texas Healthcare System offers bone density scans, also referred to as dual-energy x-ray absorptiometry, or DEXA scans. These scans are used to detect conditions such as osteoporosis, common among women after menopause. DEXA scans are also commonly recommended before women begin treatment for breast cancer to measure their baseline bone density. The scans are usually repeated throughout treatment to ensure that bones remain strong as the treatment progresses. Women over the age are 50 are encouraged to talk with their medical providers about their risk of developing osteoporosis. Women over 65 are urged to schedule a DEXA scan if they have not already done so, even if they are not at elevated risk. Heart of Texas Healthcare System offers DEXA scans for $100, plus the cost of interpretation by a radiologist. To take advantage of the low-cost mammogram program in October, or to schedule an appointment for breast cancer screening or DEXA scan, please call the Heart of Texas Healthcare System radiology department at 325-792-3535. Heart of Texas Healthcare System launches a free monthly Lunch and Learn Seminar. More than 220,000 women are diagnosed with breast cancer each year. As breast cancer continues to affect millions worldwide, combating this disease begins with awareness and education. Joining a national campaign, Heart of Texas Healthcare System is participating in Breast Cancer Awareness Month with a free Lunch and Learn Seminar on Oct. 18. The local healthcare system is launching a new monthly Lunch and Learn Seminar education series, starting with the Oct. 18 event. The program is designed to educate local residents on top healthcare issues facing the community and to provide resources that encourage health and wellness. Led by Jo Kitsmiller, PA-C, the Oct. 18 seminar is set to cover important statistics regarding breast cancer, along with risks and symptoms, as well as available local screening and treatment options. Heart of Texas Healthcare System is proud to feature a permanent digital mammography scanner. The scanner remains the most practical and accurate screening tool available for the early detection of breast cancer. The Lunch and Learn Seminar will highlight the importance of regular screening in improving treatment outcomes. Breast cancer is a malignant tumor that develops from breast tissue. Aside from early detection from screenings such as mammograms, the first noticeable symptom is typically a lump seen or felt in the breast. Though breast cancer is primarily found in women, the Centers for Disease Control and Prevention (CDC) reports that approximately 2,100 men are diagnosed with the disease each year. 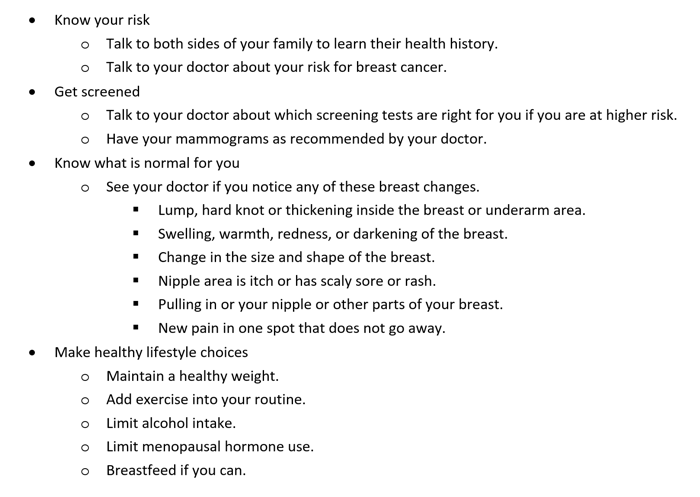 According to Kitsmiller, although there are many popular initiatives year-round to raise awareness of breast cancer, many women still do not follow recommended screening measures. The CDC recommends that most women who are 50 to 74 years old should schedule a mammogram every two years. Those who have a family history of breast cancer and are between 40 and 49 years of age should talk with their primary care providers about a personalized screening schedule. Through October, the Heart of Texas Healthcare System will be offering low-cost mammograms for uninsured individuals for only $50 plus the cost of interpretation by a radiologist. This fee is a considerable cost reduction, given the full cost of a mammogram screening, which can cost upwards of $300. In addition to digital mammograms, Heart of Texas Healthcare System offers bone density scans, also referred to as dual-energy x-ray absorptiometry, or DEXA scans. These scans are used to detect conditions such as osteoporosis, common among women after menopause. They are also used to monitor bone health during breast cancer treatment. Heart of Texas Healthcare System offers DEXA scans for $50, plus the cost of interpretation by a radiologist. Kitsmiller will lead the Lunch and Learn Seminar, which will be held Oct. 18 in the conference room at Brady Hospital. The event will take place from noon until 1 p.m. and includes a free lunch. The program is free to attend, but space is limited and expected to reach capacity. Interested individuals are encouraged to register by calling 325-597-2901. Heart of Texas Healthcare System discusses the importance of preventative healthcare. Are you healthy? Do you know whether you are at risk of cancer or another disease? Are you taking the proper precautions to prevent the onset of certain ailments? These questions, along with others, are what medical providers aim to answer during annual wellness visits. Though these essential screenings are important, the Heart of Texas Healthcare System reminds adults in the community to schedule annual wellness visits. According to the Centers for Disease Control and Prevention (CDC), regular health exams, screenings and tests can help medical providers find problems in patients before they worsen. The CDC estimates that fewer than half of American adults ages 65 and older, and fewer than a quarter of adults ages 50 to 64, receive the recommended level of preventive health services. These services include immunizations and cancer and cardiovascular screenings. Annual wellness exams typically review height and weight changes, check for possible diseases that could be treated early, update necessary immunizations, and order laboratory screenings that check cholesterol, blood pressure, and blood-sugar levels. Before your next wellness visit, Dr. Hodnett recommends that you review your family health history and make a list of any new conditions or diseases that have occurred in your family since your last visit. If you have put off any health screenings previously recommended, it is important that you share that information with your physician. Last, think about any symptoms you have been experiencing or want to ask your physician about. Most private health insurance, along with Medicare, covers the cost of preventive wellness visits once a year. For more information about annual wellness visits or to find a local medical provider, please call Brady Medical Clinic at 325-597-2114. Course hosted at Heart of Texas Healthcare System will help students improve EMS skills. To help first responders strengthen their EMS skills, Heart of Texas Healthcare System is hosting an Advanced Emergency Medical Technician Course beginning Nov. 11. Sponsored by Integrated Training Services, Inc., the course will help prepare students to provide basic and advanced emergency medical care. This course is approved through Texas DSHS, course number 613260. It is also partially funded by a Frontier and Rural Texas EMS Grant through TEEX. Students will learn how to provide critical and on-scene treatment to patients before they receive care in a hospital setting. Advanced Emergency Medical Technicians typically work with Paramedics and EMTs on an ambulance or in a Fire Department setting. The course is meant to provide knowledge and skills beyond a student’s basic EMT knowledge level to perform advanced prehospital interventions. The AEMT training includes skills such as airway management, intravenous therapy, medication administration, advanced assessment, and much more. Texas has four levels of EMS certification — Paramedic, Advanced EMT, EMT and Emergency Care Attendant. Advanced EMT is one step closer to being a Paramedic. There is a mass shortage of Paramedics in Texas, especially the rural and frontier areas. This is why it is important to bring the next level of training to Brady Texas. Integrated Training Services, Inc., is a private emergency medical training company based in Harker Heights, Texas, that provides courses approved by the Texas Department of State Health Services. They have taught EMS, Peace Officer, and Fire Fighter education courses for over 30 years. All AEMTs must already be certified as EMTs and must pass a national computer-aided exam as well as a psychomotor examination upon completion of the course. Candidates must be at least 18 years old and hold a high school diploma or GED certificate. The course is limited to 23 students, so those interested in enrolling are encouraged to register ahead of time. There is a $300 non-refundable deposit to save a seat. The cost of the course is $630, which does not include a state background check, state certification or national skills exam and related fees. ITSI also offers payment plans upon request. Prior to registration, students are required to submit an application, which can be picked up from EMS Director Alexandra Rowe at the Heart of Texas Healthcare System hospital. For more information, please contact itsiemscourses@gmail.com or call Rowe at 830-900-4132.